We lived in Mexico City, but they had some property in the state of Morelos. It took about three hours to get there from Mexico City because the road wasn’t very good. We could also get there by train, and I remember when taking this form transportation, it was very interesting and amusing. I loved looking out of the window of the train and seeing many squares different green fields, and far away, small trees, the rivers, and mountains. I remember how the train moved with the same sound and the rhythm of the wheels. But the most beautiful view we passed were the volcanoes: “IZTACCIHUATL and POPOCATEPETL”. My grandmother told me the legend about these mountains. Our ancestors told the story that one of the volcanoes was a beautiful princess, and the other was her lover, The Warrior. 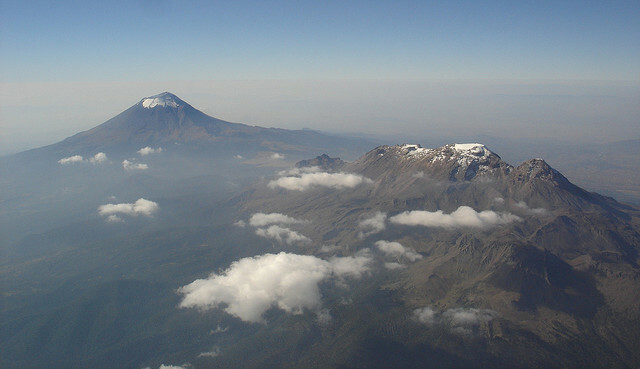 Iztaccihautl's father sent Popocatepetl to Oaxaca to do battle. The father promised his daughter's hand in marriage if the warrior returned. But probably, he thought, his daughter's lover would die in battle. So, the father lied to the daughter and told her Popocatepetl had already died in battle. Istaccihuatl died of grief. When Popocatepetl returned and saw that his love was dead, he stabbed himself with a dagger. The gods changed them both into beautiful snow capped volcanoes. Actually this view was beautiful. I wanted to continue looking at the mountains, but soon, as the train continued on, the beautiful mountains grew smaller and smaller. I have great memories of my childhood. Also by Esperanza Villanueva, read "Our Curandera (Healer)"